Irideon Riding Wear has given us permission to offer this sneak peak at a few images shot for their Spring/Summer 2010 catalog. Once again, the Irideon team held a day-long photo shoot at Quailhurst and we can honestly say that we love having them at the farm. The shoot was highly organized but never stressful. 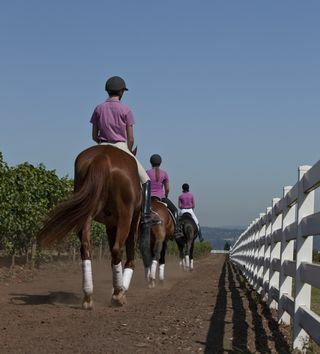 Deborah and riders Emily Anderson and Molly Knott had a great time riding together in the vineyards as the photographer snapped away. Four year old Fitch was the star of the vineyard ride, looking every bit like a professional model even though he had never before been ridden along the rows of grapes. Changing outfits throughout the day, we saw a lot of Irideon’s new spring/summer collection for women and children. 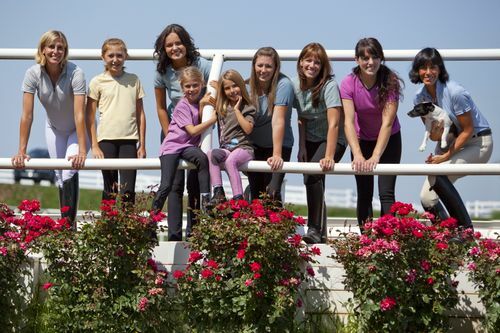 The collection includes many fantastic pieces, but our favorite by far is the new Passeio breech. The Passeio went through a lengthy research and design process and we could tell. These breeches are without a doubt the most comfortable we have ever worn, yet are 100% stylish and flattering enough for the show ring. Irideon has truly set a new standard with the Passeio! From all of us at Quailhurst, thanks to the entire Irideon crew for a very fun day! All the models at the end of the day.